Someday Lounge, 125 NW 5th Ave.
– 2 shows! 2 separate lineups! At 12:01 am on August 5, the performers will be given the text plus a few simple restrictions. Ten days later audiences will be amused, bemused, shocked, and/or enlightened… by the performance, dance, video that overflow the Someday Lounge stage. This year’s text—which the artists will have the freedom to cut, paste, rearrange, and add to from other sources—will be selected and the rules of engagement devised by Chris Piuma. 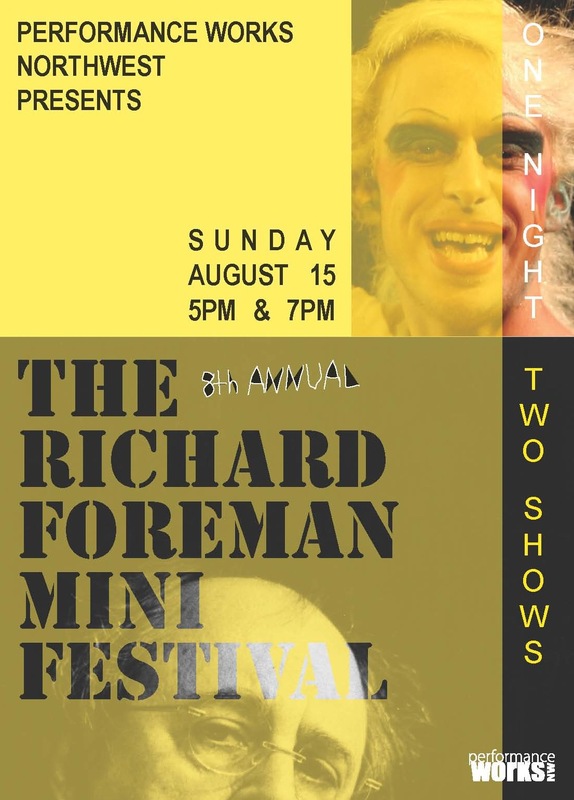 RICHARD FOREMAN is the artistic director of his own theater, the non-profit Ontological-Hysteric Theater, founded in 1968 and since the early seventies funded by the NEA, NYSCA, and many other Foundations and private individuals. From 1979 through 1985, a branch of the theater was established in Paris, and funded by the French government. The theater is currently located in the historic St. Mark’s Church-in-the-Bowery in New York City’s East Village neighborhood, and serves as a home to Foreman’s annual productions as well as to other local and international artists. Foreman’s trademark “total theater” unites elements of the performative, auditory and visual arts, philosophy, psychoanalysis and literature for a unique result He seeks to make work that unsettles and disorients received ideas and opens the doors for alternative models of perception, organization, and understanding. In 2005 Foreman began a second chapter in his work with the introduction of the digital video and film media as dominating forces in his redefinition of ontologically hysteric theater. LINDA AUSTIN the co-founder and artistic director of Performance Works NW and the inventor/director of the infamous BORIS & NATASHA DANCERS, whose revolving ranks have been filled by politicians, poets, professional waiters, IT consultants, carpenters, etc. All male, all un-trained, all glorious! After nearly a decade of spareroomic poetry, minorthirdois music,and boronatashan dance in Portland, CHRIS PIUMA is spending a few years in medieval Toronto. DAVID ABEL and SAM MILLER manipulate words and images, and are fond of film, paper, light, sound, air, moss, and pauses. CHUCK BARNES, who runs an anxiety outsourcing consultancy, collaborates with Lambda-award winning humorist LOIS LEVEEN. JIN CAMOU loves a cat named Hermes, dancing to soul music, and a good egg. She is interested in levitation, escape, and stretching. LISA DEGRACE is a clown, singer, writer, performer type. She is not an astronaut, nor does she play one on tv. GEORGIA formerly LUCE, formerly of Portland and the former Liminal, formally enjoys Portland Foreman. Happy to be. Whatta gas! Here. New York Humid August. OUR SHOES ARE RED/THE PERFORMANCE LAB members live in Portland, Easton, Florence, Manhattan, the North Shore, Los Angeles, London, New Haven, and Durham. We care about process and truth, and we produce rarely done work by great writers, devise new work, and examine the classic canon. Our next piece: Oh the Humanity by Will Eno, August 26 – September 12 at The Church in the NE. THEO WILSON: Musician, writer, Theo Wilson. ACTION/ADVENTURE loves making semi-improvised serials about 20-somethings living in SE Portland, webtastic meta-comedies about producing semi-improvised serials, musicals about carnies, multimedia extravaganzas about superheroes, and anything else that strikes their fancy, including awesome short pieces like the one you’ll see tonight. GREGG BIELEMEIER: 41 Professional years Dancing (1969-2010), Performing, Teaching, Directing and creating Choreography for many different kinds of performances including Roof Tops, River Banks and a Giant Inflatable Bubble. TIFFANY LEE BROWN is the director of New Oregon Arts & Letters and an editor of Plazm magazine. LISA RADON and TIM DUROCHE make performances/installations/recordings/writings from words, sounds, and music. This is their 8th Foreman Festival. MIZU DESIERTO is a choreographer, performer and designer and is the founder and artistic director of Water in the Desert and The Headwaters Theatre. FORMSPACE is a collaboration of theatre artists dedicated to discovering truth and beauty between form and space. DANIELLE ROSS is a Portland-based performer and choreographer. She is the co-founder of Little Friction Dance. The agentz of blaze orange known as FUTURE DEATH TOLL utilize vintage electronicz such as rotary pwnz, synthesizerz, and drum padz to perform back alley open-heart surgery on their most enthusiastic patientz. DOUG THERIAULT (buzz-r-electronics.com) bakes up luscious twisty treats in the basement. CYNDY CHAN meticulously handcrafts mysteriominous critters from industrial debris.